Travel makes paths itself, I never plan it! Before I start sharing my experience of a trip, I would like to introduce myself and what keeps me travelling. I never believe in going on trips, instead, I travel to the place: I absorb the place and this helps me to keep heads-on! I never take a route that is so often travelled by, instead, I have learned to make my journey interesting. I have been to places to love and admire nature but at the same time, I have learned how we humans recklessly are destroying the places we love to go. In this blog, I would highlight one of my cherished travel destinations. I have termed it as a favourite because of unexpected things that led me to the place. Himachal Pradesh is the most sought-after destination for any traveller. I managed to get a few days to leave from my conventional routine to escape to the alluring mountains of Himalayas. Due to less number of leaves, I planned my holiday to Shimla but what happened next was more than profound. So that fine weekend, I took a train to Kalka from Delhi. As I planned my trip a day before so without arranging any ticket I boarded Howrah-Kalka express to Kalka and reached the foothills. After reaching Kalka at 5:00 am in the morning I enquired about the Toy Train Services to Shimla. My bad, there was only a single train to Shimla that day which had no reservation available. I took my bag pack and boarded the general coach of the toy train and without expecting any seat. I journeyed for about 4 hours standing and reached Shimla at 11:00 am. After spending a few hours in Shimla, I couldn’t find the solace I was in search of. Shimla at that time was crowded with enjoyable faces and seeking tranquillity in these fun activities was difficult for me. So I went to the famous coffee house in The Ridge, Shimla and planned to move to some other destination. I jotted a few places on Google and listed them: Dharamshala, Mcleodganj and moved to the bus terminal in Shimla. I checked the time it was 16:00 hours. Before boarding, I wanted to get more information about the places that can be visited. Meanwhile, at the bus terminal, I met a guy, I hesitantly approached him to get more information about the bus going to different places and sought some advice on places that could be travelled. He sheepishly said, “why don’t you go to Peo, it’s beautiful and it’s en route to many other places and the bus to Peo will leave soon”. Without giving it a second thought, I boarded a bus going to Reckong-Peo at 18:00 hours. It is easy for me to write this name now, but trust me at that moment till I reached the place it was even difficult for me to even pronounce its name. Locals called it as Peo, so soon after boarding, I inquired many about the timings of the bus. As I was travelling solo, public transportation is particularly safe plus I had less money so couldn’t afford to take a cab. The third and the foremost reason I avoided cabs because I was not aware of the place I was going not even by its name! I reached Peo at 5:00 am, it was still dark and unbelievably cold at that time of the year. The bus terminal was small and had nothing except a canteen that served some tea (with extra sugar). Still, the tea was enough to keep me warm. Distantly, I saw few people burning wood to keep themselves warm. I went to join that group so that I could grab some information about the place to get an idea of where to head next. The people explained to me that Reckong Peo was a headquarter of the Kinnaur district of Himachal, and I could visit a number of places from here- Kalpa, Sangla, Kaza and so on. I approached the ticket counter to inquire about which bus would soon depart from here. He exclaimed, “Madam, at 7 am the first bus will depart to Kaza”. 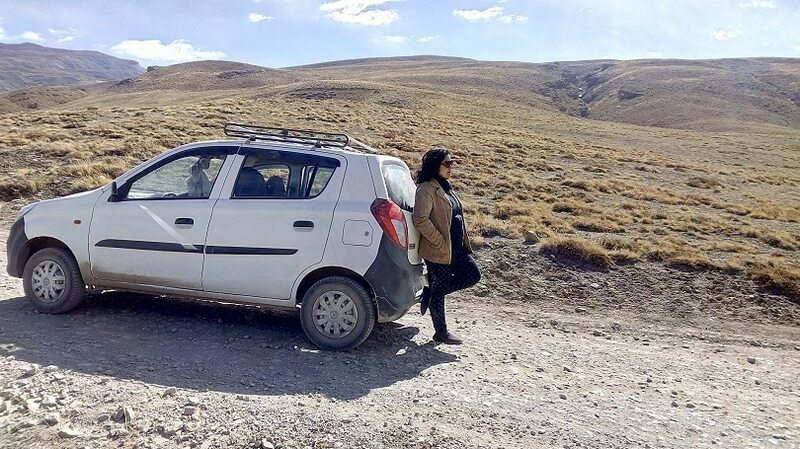 Without thinking much about the place and without googling the place (as there was no internet connection there), I got the ticket to Kaza without calculating how much time it would take me to be in Kaza. The bus started at 7 am, now the hills were no longer the same I had seen in my life they were turning mighty, camouflaging with the sun rays. Satluj river was flowing along the route. The picturesque landscape refreshed me. I was able to cope with the tiresome night journey on the bus. While I was travelling to Kaza I understood and my heart spoke that, “this was the solace I was searching for and this is all I want in life”. I can’t explain how beautiful the mountains looked. I can’t measure its beauty in words, all I can say is that I spent nothing but received a rejuvenated self. It was noon soon and I could see cars and buses standing in a queue. Locals panicked and said, “Another landslide. The BRO guys have been working since last night, hope the route will open in an hour”. An hour or two passed and the BRO men waved us off a happy journey. The turns of the hill grew more treacherous. I could see stones falling deep down with every turn the bus took. The highway just a 7 feet wide route! Evening approached and I could see some boards by BRO in Spiti and Lahaul District. I smiled and felt happy within, this is a trip I will forever remember. It was 7 in the evening after a 12-hour long journey through the narrow hilly lanes. I found myself amidst a small town surrounded by mammoth mountains. I started searching for a hotel, to my bad luck all the local hotels were closed for the winter season but to my luck I got a home-stay to shed off the tiresome journey. I woke up late in the morning due to cold and after the gruesome travel. I booked a local cab to visit nearby villages. I started with Langza, known as the marine fossil village. The Buddha statue known to be 1000 years old was another attraction. The beautiful village looked so sublime and tranquil I took a fossil from one of the villagers as a memento. 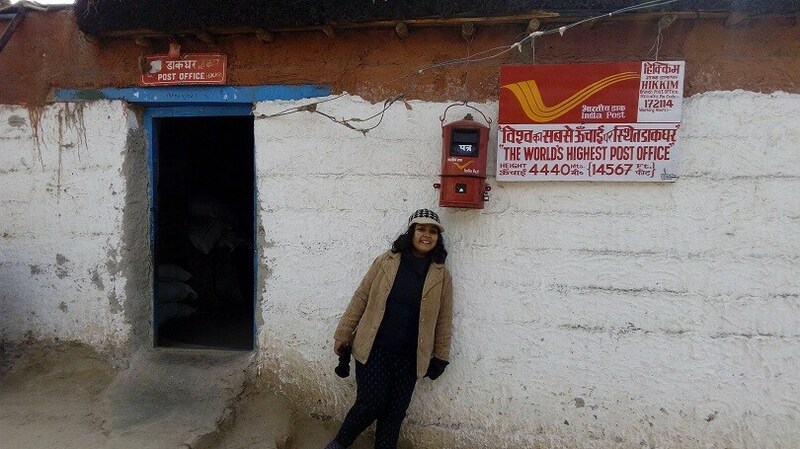 Then geared up for the next destination that was Hikkim, I never knew when I was about to pay a visit to the world’s highest post office. After I wrote a letter and stamped it to my address in Delhi (which I never received). I explored the village and spent light moments with a village lady who offered me with some Jowar. After a while, I tried my luck on a mule ride. After spending a few hours here I gasped to my cab driver, “Let’s move to Asia’s highest village Komic.” Truly Spiti Valley has it all! Komic village is at an altitude of almost 14800 feet beautiful white houses make this village splendid. Next was Kibber that is known to have the world’s highest school. I faced breathing issues while being in Kibber. The next destination was the famous Key Gompa, I spend about an hour in the monastery talking with the monks having chai with them. The key monastery is the perfect example where one can find serenity. After exploring all the nearby villages I moved back to Kaza to end the day and planned for the next destination. The next day I thought of moving to Lossar. Lossar is a picturesque village famous as the starting point of the Chandertaal trek. 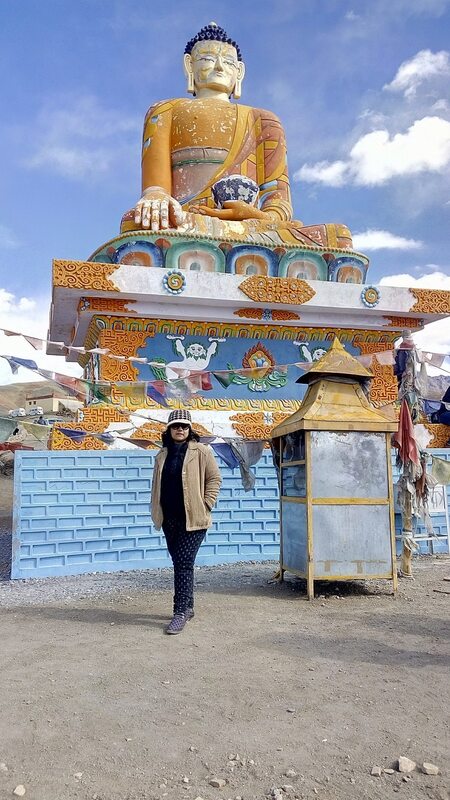 It is also close to the Kunzum La pass and connects Spiti with Manali. After reaching Lossar at around 10 in the morning I was baffled to see the village roads paved with snowflakes and the stored water crystallized into ice. After paying a visit to Lossar, I moved towards Kunzum La. It had a small temple right in the middle of the snow-capped mountains. Now, it was time to move to the end of the journey. The road to Manali was beautiful but equally dangerous with water and snow making it slippery. 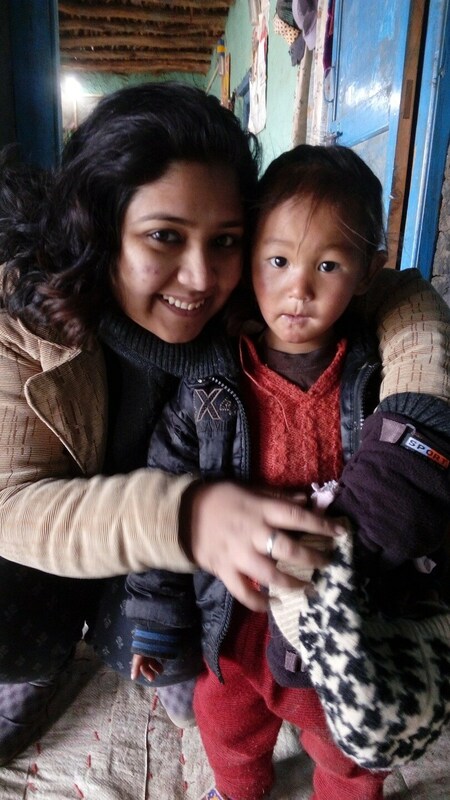 After a 10 hour journey when I reached Manali I was not the same person I was before. The place changed me my thoughts and my perspective towards life.